Tom D. White poses with a wolf he shot illegally in 2008. He and other family members were convicted of federal offenses to endangered species laws in 2012. Three members of a Twisp, Wash., family were each sentenced to three years probation in U.S. District Court in Spokane Wednesday for their respective roles in a case that involved the illegal killing of two wolves and efforts to ship one of the pelts to Canada. William D. White, 62, had pleaded guilty to conspiring to kill a protected wolf and send its pelt to a friend in Canada in return for the friend’s help in illegally killing a moose. In addition to the three-year probation, he received six months of home detention and was fined $15,000. He previously paid $35,000 in fines related to the illegal taking of the moose in Canada. His son, Tom D. White, 37, pleaded guilty to killing two endangered gray wolves in May and December of 2008. In addition to the probation, he received three months of home detention and was fined $10,000. 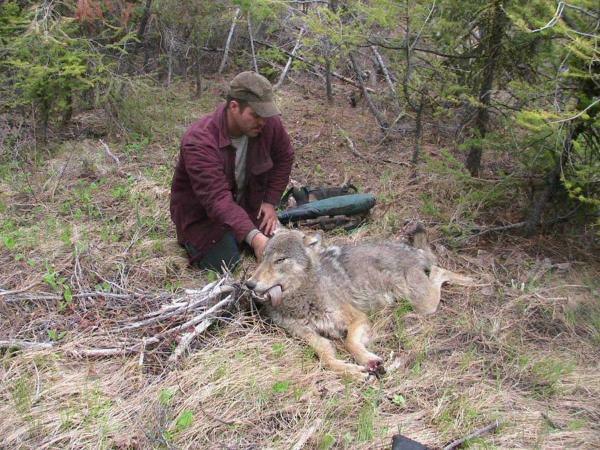 The two men must also pay $20,000 in restitution for wolf research and monitoring to the Washington Department of Fish and Wildlife. Both are prohibited from hunting during the three-year probation. Tom White’s wife, Erin J. White, 37, pleaded guilty on two counts involving exporting an endangered species – charges stemming from her role in mailing the wolf pelts. A FedEx employee noticed blood seeping from the package and alerted Omak, Wash., police, which prompted a federal investigation. In addition to her probation, Erin White was fined $5,000. A 15-year-old boy was pulled from the bottom of Spirit Lake and flown to Providence Sacred Heart Medical Center on Wednesday afternoon. The Kootenai County Sheriff’s Department said the boy was under 7 to 8 feet of water when a Kootenai County deputy dove into the lake to retrieve him. The initial emergency call came in around 4:40 p.m. when a person saw another boy calling for help in the Mill Pond area of the lake. People on the road flagged down the deputy, who reached the scene on a private boat. The deputy brought the 15-year-old to a Spirit Lake Fire District boat, where firefighters started CPR. The 16-year-old was taken to Kootenai Medical Center. The sheriff’s department said the boys’ conditions are unknown. A Spokane woman who had 50 dogs and cats packed into a squalid bungalow in Hillyard has been charged with animal cruelty. Laneva Marsha Erskine, 57, faces nine misdemeanor charges stemming from a February raid at her home at 3622 E. Crown Ave. in which workers wore hazardous material suits and respirators to combat the heavy stench. SpokAnimal has been fielding complaints about Erskine for at least 28 years. Erskine said her elderly husband was hospitalized with a broken leg and she didn’t have time to clean up the home. She said the cats were strays that she couldn’t afford to take to SpokAnimal and pay a fee. The nine misdemeanor charges filed against Erskine allege nine cats suffered severe dehydration, weight loss, curled toenails and severe flea infestations, as well as upper respiratory infections and hair loss.